Sabre Esler is an Atlanta based multimedia artist with an MFA from SCAD. Esler’s work has a focus on human psychology and visual metaphors of thought. 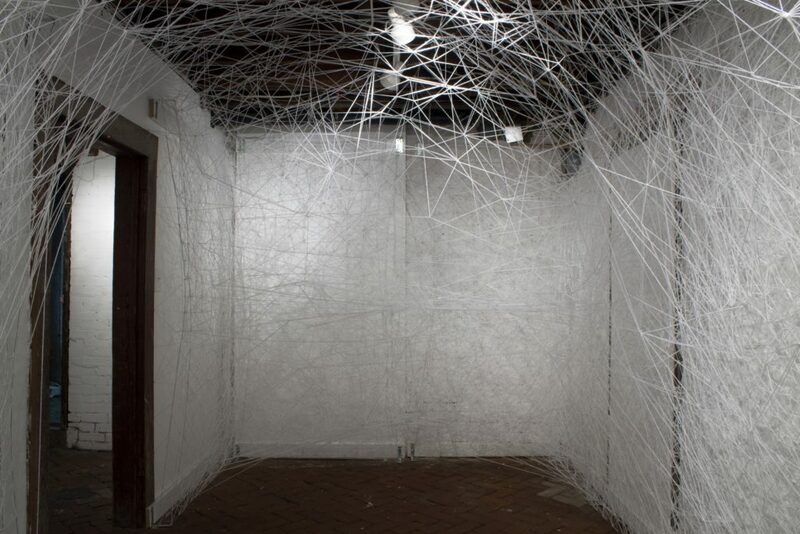 Her exhibition White Lies filled whitespec with a tangle of carefully tied white strings overlapping and bending away from each other in a matrix. Upon entering the exhibition, the artist displayed a statement for the audience about psychology and politics and its relation to the work. To better understand the metaphors and logic behind White Lies whitespace asked Sabre Esler a few questions about White Lies. whitespace: How does the title, White Lies, relate to the current political climate that you reference in the exhibition wall text? Sabre Esler: I am always interested in the patterns that decision making creates. In this case, the current cultural and political climate is one with little trust, because our culture has turned a blind eye to the importance of truth. I was fascinated to learn that lying actually causes different pathways in the brain to form. I had no idea when I first decided the theme would be white lies, that there was a body of research devoted to understanding how lies affect the way people think. In reading about white lies, the general belief is that if there is a portion of truth, but not the whole truth, that it’s not a bad thing to do. Further investigation exposes that white lies are really the beginning to a much deeper, more troubling, breach in the pathways and circuitry that are constituted in the brain and its wiring. White lies allow people to begin to deceive, but its easier to tell outright lies, because practice makes perfect. So yes, our current climate and culture have an acceptance of this phenomenon of lying. I want to expose that cultural norm for what it is a state of mind we have put ourselves in. whitespace: The work involves a viewer being immersed in the space that you’ve created, can you talk about the relationship between the viewer and the installation? As the artist, you are controlling where the viewer can be within the space, can you elaborate on your decision making process as well? Sabre Esler: I like the concept of installation work because the viewer can be immersed in the artists’ ideas. Because I am working in a conceptual way about something that is inside our mind, I like the ability to immerse my viewers in the overwhelming and abundant patterns inside the space. Ultimately, space determines how my patterns will play out. Because this space is long and narrow, I wanted the viewer to be able to see great depth in how the patterns keep happening, just like experiences, and how they overlap to create a very complex web of connections. However, I also wanted viewers to be able to approach the work, that meant leaving the narrow walls in the middle with layers that are intricate, but don’t have the sense of depth that the ends are able to afford. If it was a square room, perhaps I would have created the depth equally on all four sides. I’ll leave that for my next installation. whitespace: Who has influenced your work? Sabre Esler: Tomas Sarenceno was the first artist that I saw using cording to create a web-like structure. I had the opportunity to travel to Berlin and see his amazing piece in The Bunker. I researched what he was doing and fell in love with his concept. I am not as interested in spiders as he is, but I do appreciate his expertise and novel approach. I went back to my studio to see if I could incorporate the size of what he was doing with my small sculptures that I had made the previous year. I discovered there is a huge learning curve in creating installations. Shortly after that, I received the opportunity to create my first mind space installation and had to get up to speed quickly in how to create my work on a grander scale. It just so happened that Chiharu Shiota was showing at the SCAD Savannah Museum. I went down to see her work in person. Her work is similar in weaving to mine, although different because our ideas aren’t exactly the same. When I see her work, which is amazing if you haven’t, you should look her up; I am taken with the emotion of longing, sadness, or wistfulness. Many of her pieces imbed tokens or signifiers of memory, things of the past. My interest, on the other hand, is more of a universal appeal to everyone of the experiences and pathways towards decisions we face given a certain set of circumstances. I hope to explore other decision making concepts in the future, but I don’t think I will use tokens as she has done. whitespace: As an installation artist, how do you know when your work is completed? Sabre Esler: I am happiest with the work when I can see an evolution of the patterns that I am making. I start with the grid in the background, which is like a pristine construct of the world we live in. If everyone did the right thing, or was a computer, only understanding and doing binary things, we would have a grid-like experience and world. However, we are not computers, we are imperfect machines that make a mess of things, many times, but it is a beautiful mess. The patterns I am going for are complex, but have a crystalline structure, they alter, but still abide by many of the same rules, even when altered over time. I like it when I can get at least three or four layers of patterns so that the size and scale of the pattern can be seen. I am not sure if I know exactly about the completeness, other then that the space can only hold so many layers, and then I just have to be finished. Also, my materials can only support so much weight or the structures start to wilt. I feel like I am using a lot of architectural thinking in my structures. I am taking a material that has no structure to it, and making it appear to have geometric properties. I feel like it is successful if the shape holds up, can support itself, even though it is really using cantilever type construction. I haven’t worked larger then the current installation; I suppose I would be testing myself and the concept of “complete” if the room was bigger then the patterns I could construct. Elser’s exhibition, White Lies, ended on September 1, 2018. This entry was posted in Uncategorized on September 28, 2018 by blog814.